Are You Less Happy Than Your Peers? Join the Discussion. Compare your lifestyle across 25 specialties. ** Respondents were entered into a sweepstakes to win an Apple iPad 2 16GB Wi-Fi Enabled Device awarded to 5 physicians. How Happy Are Physicians With Their Lives Outside of Work? According to a 2006 Pew Report, 34% of Americans say that they are "very happy," 50% "pretty happy," and 15% "not too happy." Medscape asked US physicians how happy they were with their lives outside of medicine and to rate their level of happiness on a scale of 1 to 5, with1 being the least happy and 5 being the most. Approximately one third of physicians -- both men and women -- rated themselves a 5 (approximating the "very happy" in the Pew report) and 40% rated themselves a 4 (suggesting "pretty happy"). The average happiness score for physicians who responded was 3.96, which is on the cheerful side but not overwhelmingly happy. 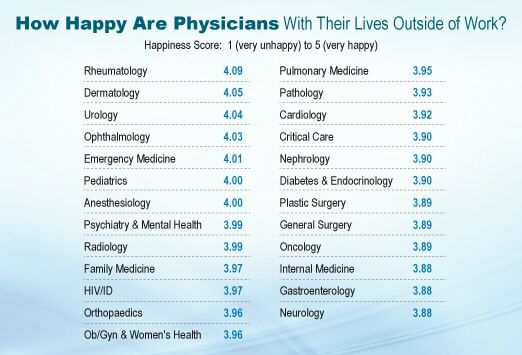 When looking at happiness ratings by specialist, the 5 happiest were rheumatologists (4.09), dermatologists (4.05), urologists (4.04), ophthalmologists (4.03), and emergency medicine physicians (4.01). The 3 least happy professionals were tied at 3.88: neurologists, gastroenterologists, and internists. The next unhappiest were oncologists, general surgeons, and plastic surgeons, all tied at 3.89. What Are Physicians' Favorite Pastimes? 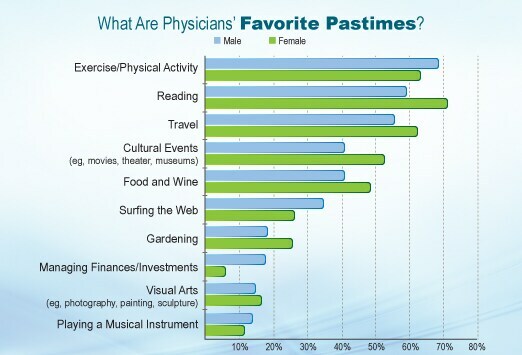 Male and female physicians rated their top 5 pastimes in the same order: exercise/physical activity; reading; travel; cultural events; and food and wine. The higher percentages cited by women for activities 2 through 4 perhaps suggest a slightly greater enthusiasm for them compared with their male counterparts. More straightforward gender differences were apparent, however. Over a third of men but only 25%of women liked surfing the Web, although over 13% of women chose social media as a favored pastime compared with about 8% of men. Over 17% of men enjoyed managing finances compared with less than 6% of women. Other favored physician activities, cited frequently in write-in answers, included sewing and knitting, working with animals, and singing. 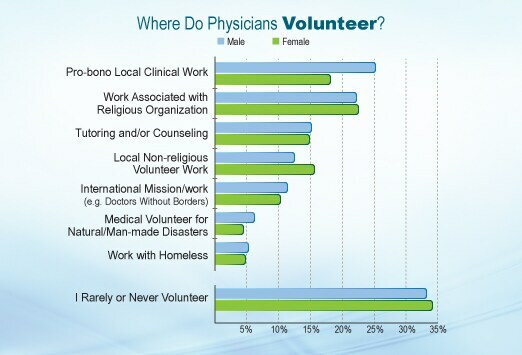 In the Medscape survey, about two thirds of physicians reported participating in some form of volunteerism, while a third of both male and female physicians rarely or never volunteer. When they do, about a quarter of men and 18% of women choose pro-bono work in a local clinic. No significant gender differences appear with other types of volunteering. About 10% of both men and women do international mission work, approximately 22% volunteer with a religious organization, and over 14% tutor or counsel. The most unhappy physicians, according to self-rating, were those who didn't volunteer, followed by those who tutored or did counseling. Doing any type of volunteer work was associated with a higher happiness self-rating score than the overall average score of 3.96. Of note, in a 2000 survey published in the Archives of Family Medicine, physicians who viewed benevolence as a guiding principle in their lives reported a higher level of professional satisfaction. Many physicians who provided write-in responses said that they volunteered at their children's schools. Other specific volunteer groups mentioned were Habitat for Humanity, Humane Society, American Red Cross, and Girl/Boy Scouts of America. A Rasmussen Report in May 2011 reported that 29% of American voters characterize themselves as both fiscal and social conservatives, and only 10% said that they are liberal in both areas. In the Medscape poll, physicians seem to be slightly more extreme on either side. 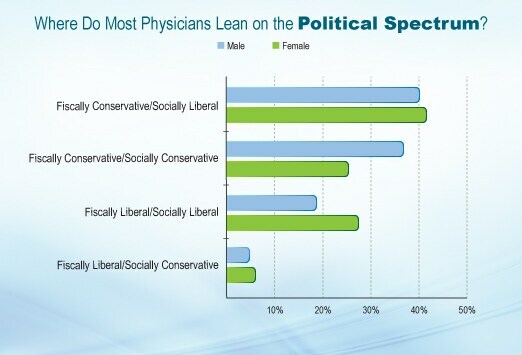 When asked about their political leanings, approximately 37% of male physicians and 25.5% of women defined themselves as being conservative both socially and fiscally. Only 18.4% of male physicians but 27.5% of female physicians described their views as being liberal in both areas. When broken down, the great majority of physicians are fiscally conservative (77% of men and 68.9% of women). Women tended to be more liberal both socially (66.8%) and fiscally (31.1%) than their male peers (58.6% and 23%, respectively). 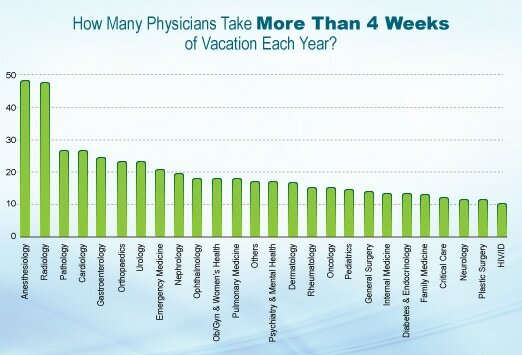 How Much Vacation Do Physicians Take Each Year? With an average of 13 paid vacation days per year, Americans do far worse than those in other developed countries (eg, Italy, 42; France, 37; Germany, 35; United Kingdom, 28; Canada, 26; Japan, 25). The amount of vacation that physicians take also seems to vary widely depending on specialty. About half of all physicians take 2-4 weeks off from their work. However, like their patients, more than a quarter of internists, general surgeons, and family and emergency medicine physicians take off for only 1-2 weeks a year. As evidence that some physicians have more fun than others, nearly half of anesthesiologists and radiologists who answered our survey took more than 4 weeks of vacation each year. 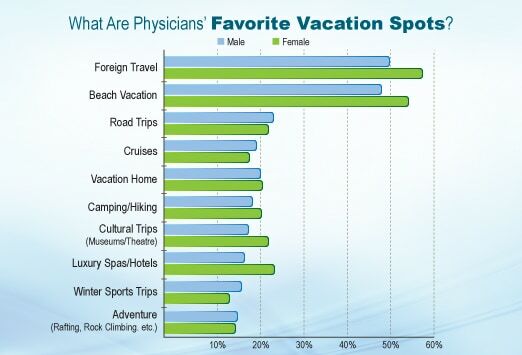 What Are Physicians' Favorite Vacation Spots? According to a 2009 survey from US Travel Association, activities with the greatest interest among US adults are, in order of popularity, visiting friends and relatives, sightseeing, going to beaches, visiting museums, going to national or state parks, going on cruises, visiting theme parks, traveling to cities, and visiting mountain areas. Physician-preferred vacations, at least among those who responded to the Medscape survey, perhaps reflect generally higher incomes. First and second choices for both male and female physicians were traveling abroad and beach vacations, and more women appeared to enjoy these vacations than men did. For subsequent vacation choices, there were only slight differences in gender preference, except for luxury hotels (preferred by women) and winter sports trips (slightly preferred by men). Not listed as an answer choice in the Medscape survey but mentioned most frequently in the write-in responses was visiting family members. Other write-in preferred activities were long train rides, nonmedical learning trips, and doing nothing at all. One respondent, in fact, only wanted to "sip tea quietly." 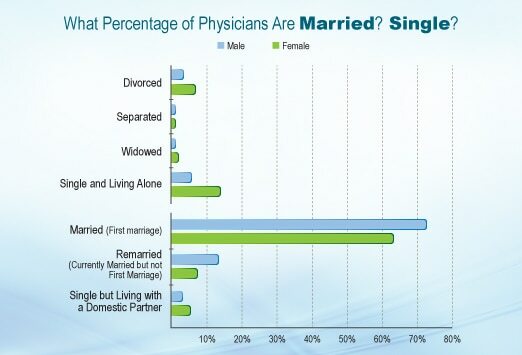 What Percentage of Physicians Are Married? Single? Among physicians who responded to this survey, over 85% of men and 71% of women are married, a rate far above that of the general US population. In fact, the current US Census found a drop in the percentage of married Americans over the past 40 years, from 72% in 1970 to just 48% in 2011. This parallels a recent Pew Research report finding that only 51% of US adults are currently in a marital relationship. The report also found that the current marriage rate for people under 30 was only 20%. In the Medscape survey, nearly half of physician respondents in that same age group reported being married. Male physicians, whether married or single, were more likely to be living with a partner (89%) than their female peers (76%). Over 14% of women said that they are single and, presumably, have never been married, compared with only 5.62% of men. 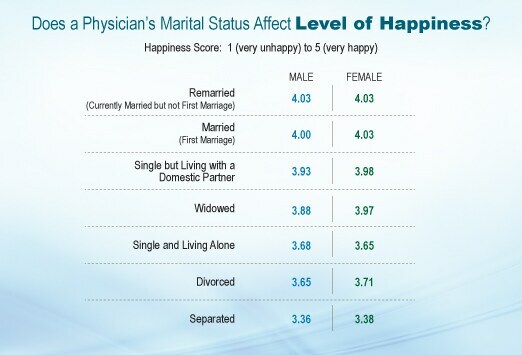 Does a Physician's Marital Status Affect Level of Happiness? When looking at marital status, the highest self-rated happiness scores went to both men and women who were in their first marriage. In any case, living with a partner boosted happiness in general over living alone. Among both men and women without partners, being a widow or widower was not as unhappy a state as being divorced, and everyone was better off emotionally, it seemed, than those in the difficult state of separation. 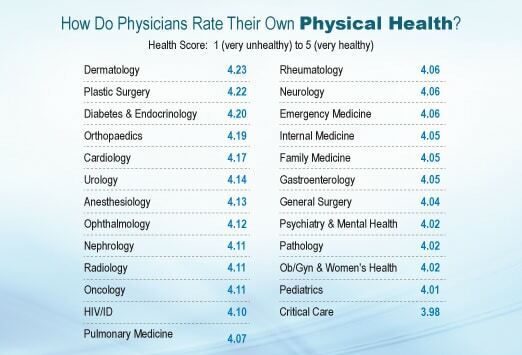 How Do Physicians Rate Their Own Physical Health? 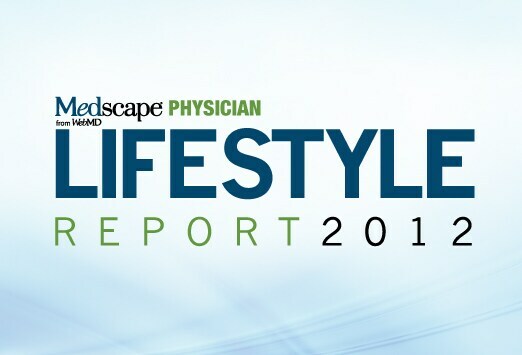 In our survey, the healthiest specialists by self-report were dermatologists, plastic surgeons, endocrinologists, orthopaedists, and cardiologists. The 5 least healthy were psychiatrists, pathologists, ob/gyns, pediatricians, and physicians in critical care. Because internists and family and emergency physicians were also in the bottom 10, it is tempting to conclude that those who go into general medicine are in worse shape than their subspecialty peers. Of interest, the order of healthiest specialists did not particularly correlate with happiest specialists (unless one counts dermatologists, who seem to be both very happy and very healthy). How Many Physicians Are Overweight? According to CDC statistics, in 2008 40% of US men were overweight and 32% were obese. Physicians in our survey didn't do much better: Approximately 37% of male doctors reported being overweight, with 5.3% being obese. This was very similar to a 2004 study that found 38% of male physicians to be overweight and 8% obese, suggesting that the situation has not improved much over the past 7 years. As for women, according to the CDC, 28.6% were overweight in 2008 and 35% were obese. 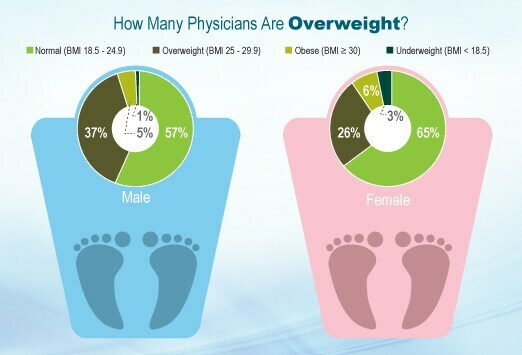 In the Medscape survey the percentage of women physicians who reported being overweight tended to be slightly lower (26%) than the nation's women, and obesity rates were also much lower (6.2%). Physicians' own weights may play a role in how they talk to overweight patients. A 2012 study in Obesity reported that physicians with normal BMI were more likely to engage their obese patients in weight loss discussions compared with overweight or obese physicians (30% vs 18%). In a Medscape discussion on overweight physicians, a primary care physicians wrote, "We are all fallible. Physicians need to address this directly when communicating with their patients -- why they choose to remain fat or to smoke -- so they can be credible." How Often Do Physicians Exercise? According to the CDC, between 1999 and 2009 the percentage of men 18 years of age and over who met the 2008 federal aerobic activity and muscle-strengthening guidelines increased from 19% to 22%. According to the Medscape survey, then, physicians do better than the average American, and the older they get the more they exercise. 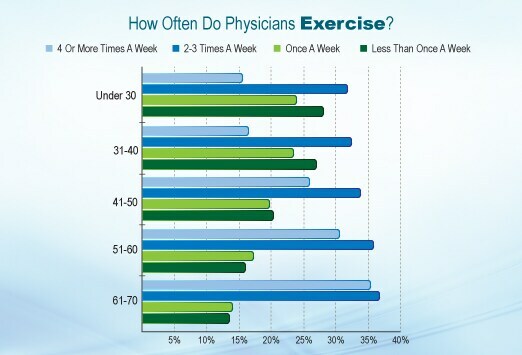 About 48% of physicians under 30 exercise at least twice a week. After age 61, more than 72% are exercising at least twice a week. Whether this is a matter of free time or consciousness of aging cannot be determined from this survey. According to the response to the next question, about 7% of female and 8% of male physicians do not exercise at all. 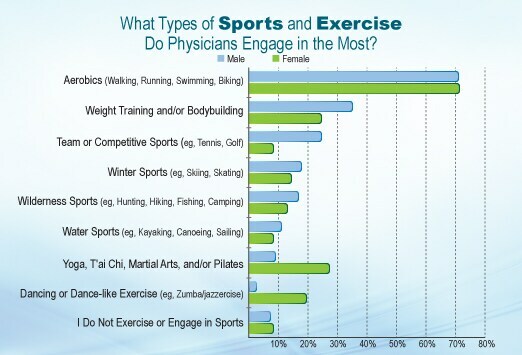 What Types of Sports and Exercise Do Physicians Engage in the Most? For both men and women, aerobic activities are by far the most common and popular exercises (over 71% for both). Specific activities mentioned by dozens in the write-in responses were cycling, elliptical training, and walking. More than 35% of men chose weight training next, with nearly a quarter of women also lifting iron. Among women, yoga and other Eastern practices pulled only slightly ahead (27%) of weight training, with these activities appealing to less than 10% of men. Although about 19% of female physicians enjoyed dancing, they obviously lacked male partners, with less than 3% of men selecting this form of activity. Men were more likely than women to engage in competitive sports (24.7% vs 8.3%), with golf being the sport mentioned most often. Winter and wilderness sports appealed to approximately 17% of men and 14% of women, with many physicians citing rock climbing as a specific favorite. Among other write-in responses, horseback riding was a major interest for dozens of physicians, and many also cited farming and ranching. Although the national quit rate has increased slightly over the past few years, according to a 2011 Harris poll, 18% of Americans still smoke. 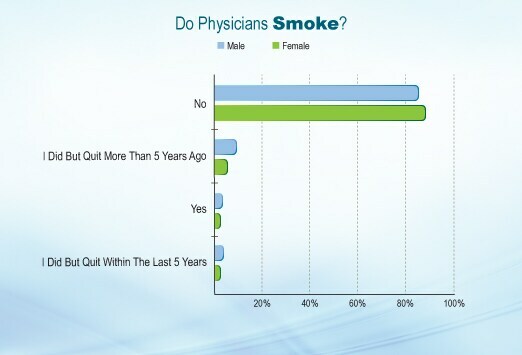 Among nonsmokers, physicians lead the national pack: Only 2% of men and 1.28% of women report that they smoke. About 9% of men and 5% of women were once smokers but quit. How Often Do Physicians Drink Alcohol? As reported in a 2010 Gallup poll, 67% of American adults drink alcohol, a rate that has been "remarkably stable" since this began being tracked in 1939. According to the Medscape survey, male physicians are slightly ahead of the national population, with 73.4% reporting that they drink. 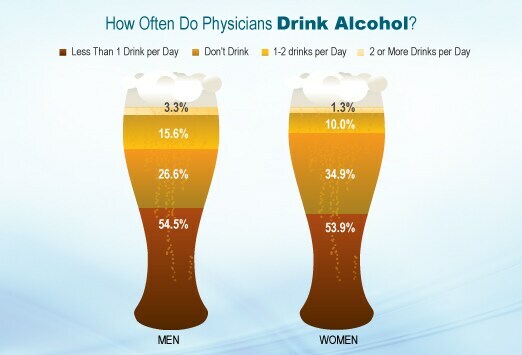 Female physicians are closer to the national average, with 65% saying that they drink alcohol. Our survey suggests that physicians tend not to overindulge: Over half report having not even 1 drink a day, and about a quarter of men and a third of women do not drink at all. About 15% of men and 10% of women report having 1-2 alcoholic beverages a day, with only 3.3% of men and 1.25% of women admitting to more than 2. As of December 2011, a Gallup poll reported that 52.5% of Americans considered themselves to be thriving, 43.7% were struggling, and 3.7% were suffering. Our Medscape survey indicates that many physicians also perceive themselves as having financial difficulties. Over 38.8% of the physicians in active practice who responded said that they had no or minimal savings for their age and stage. 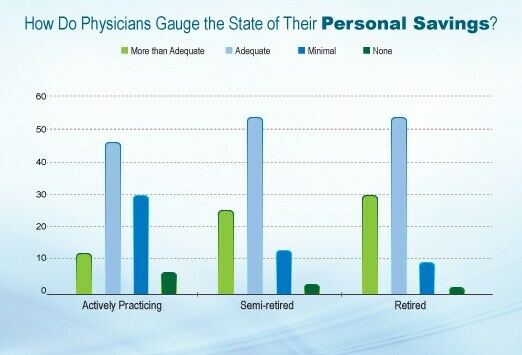 Only 12.8% of these physicians believe their savings to be more than adequate. Such responses could reflect the more difficult economic climate for the younger generation of physicians. Of note, well over 80% of physicians in our survey who are semi- or completely retired believe that they have adequate or more than adequate savings for their stage in life, but they comprise only 15% of all who responded. According to a 2008 Pew Report, 88% of Americans believe in God or a universal spirit. 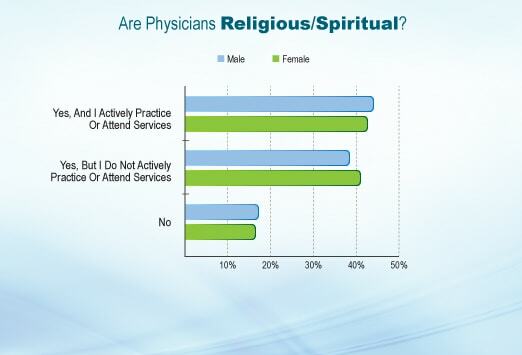 In our Medscape poll, instead of asking for specific religious affiliations, we wanted to know whether physicians have a spiritual belief, regardless of active participation. When asked if they have any religious or spiritual belief, 83% of physicians reported that they do, with slightly over 40% of them actively practicing their faith. The remaining 17% had no belief system. Of note, there were almost no differences at all between men and women in regard to having or not having a belief and actively or not actively practicing. In the Pew report, men were significantly more likely than women to claim no religious affiliation: nearly 20% of men vs roughly 13% of women. 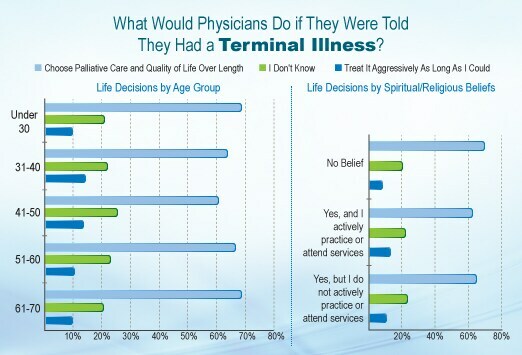 What Would Physicians Do if They Were Told They Had a Terminal Illness? Do Physicians Use Social Media? 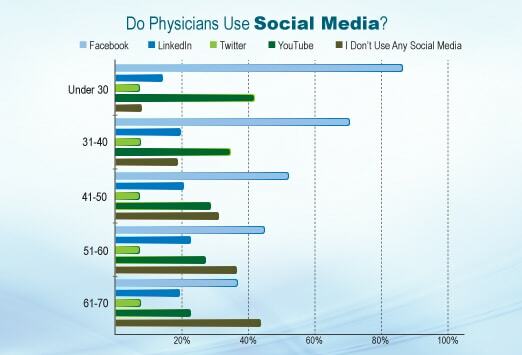 No surprise: The use of social media drastically decreases with the age of the physician. Only about 8% of physicians under 30 do not use it, while approximately 44% of those over 61 are not engaged in any social media. Facebook is the most popular medium among all age groups, being used by over 87% in the under-30 group and by over 36% of those over 61. LinkedIn, the network that provides professional contacts and connections, is used by roughly 20% of all physicians over 31. Twitter is not widely used by many physicians but, interestingly, approximately the same percentage (around 7%) of each age group surveyed tweets and/or follows. 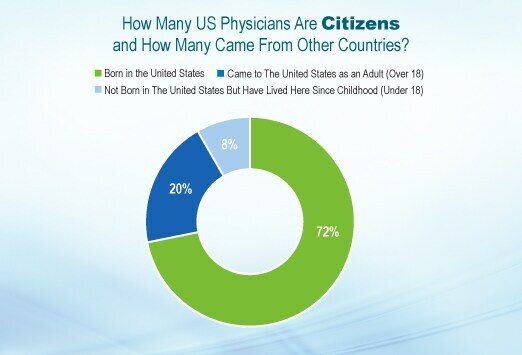 How Many US MDs Are Citizens and How Many Came From Other Countries? About 72% of the physicians who answered the survey were born in the United States and approximately 8% came here as children. Nearly 20% of the physicians who responded came to the United States as adults, which is slightly lower than the 26.3% rate reported by the Migration Policy Institute in 2007. In this report, Asia was the origin of the greatest proportion of foreign-born physicians -- around 22% -- followed by Europe/Canada/Oceania at about 16%. Africa contributed about 12% and Latin America 6%. 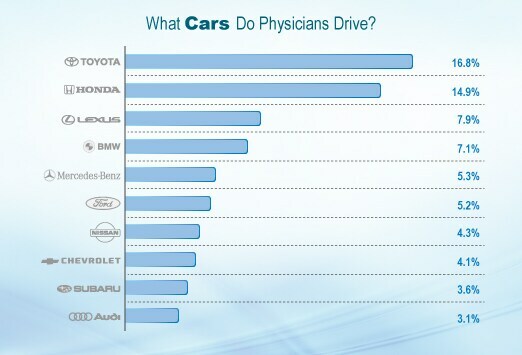 What Cars Do Physicians Drive? In 2011, the top 4 highest selling cars in the United States were made by non-US companies: Toyota, Nissan, and Honda, with Ford coming in fourth. Physicians who answered the Medscape survey also listed foreign-made cars in their top 5: Toyota (16.73%), Honda (14.8%), Lexus (8.3%), BMW (7.5%), and Mercedes-Benz (5.32%). Ford came in a very close sixth at 5.24%, and Chevrolet came in eighth at 4.13%. 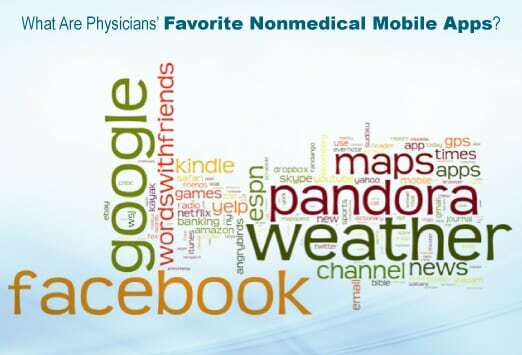 What Are Physicians' Favorite Nonmedical Mobile Apps? Pew Research Center. Are we happy yet? February 13, 2006. http://pewresearch.org/pubs/301/are-we-happy-yet Accessed February 13, 2012. Eliason BC, Guse C, Gottlieb MS. Personal values of family physicians, practice satisfaction, and service to the underserved. Arch Fam Med. 2000;9:228-232. Rasmussen Reports.29% say they're conservative on both fiscal and social issues. http://www.rasmussenreports.com/public_content/politics/general_politics/may_2011/29_say_they_re_conservative_on_both_fiscal_and_social_issues Accessed February 4, 2012. U.S. Travel Association. Travel facts and statistics. http://www.ustravel.org/news/press-kit/travel-facts-and-statistics Accessed February 8, 2012. Tavernise S. Married couples are no longer a majority, census finds. NY Times May 26, 2011 http://www.nytimes.com/2011/05/26/us/26marry.html Accessed February 8, 2011. Cohn D, Passel J, Wang W, Livingston G. Barely half of US adults are married – a record low December 14, 2011. Pew Research Center. http://www.pewsocialtrends.org/2011/12/14/barely-half-of-u-s-adults-are-married-a-record-low/ Accessed February 5, 2012. Centers for Disease Control and Prevention. Health, United States, 2010; with special feature on death and dying. US Department of Health and Human Services. National Center for Health Statistics. http://www.cdc.gov/nchs/data/hus/hus10.pdf#fig14 Accessed February 5, 2012. Ajani UA, Lotufo PA, Gaziano JM, et al. Body mass index and mortality among US male physicians. Ann Epidemiol. 2004;14:731-739. Harris Interactive. Healthy and unhealthy behavior and lifestyle trends: no significant change in 2011 in proportions of adults who are obese, smoke or wear seatbelts. May 25, 2011. http://www.harrisinteractive.com/vault/HI-Harris-Poll-Healthy-Behaviors-2011-05-25.pdf Accessed February 4, 2012. Newport F. U.S. drinking rate edges up slightly to 25-year high. Gallup Wellbeing. July 30, 2010. http://www.gallup.com/poll/141656/drinking-rate-edges-slightly-year-high.aspx Accesses February 4, 2012. Morales L. Fewer Americans "thriving" in 2011 than in 2011. Gallup Wellbeing http://www.gallup.com/poll/152033/Fewer-Americans-Thriving-2011-2010.aspx Accessed February 4, 2012. Pew Forum on Religion & Public Life/U.S. Religious Landscape Survey. February 2008. http://religions.pewforum.org/pdf/report-religious-landscape-study-full.pdf Accessed February 13, 2012. Living Well At the End of Life: A National Conversation. The National Journal and the Regence Foundation. http://syndication.nationaljournal.com/communications/NationalJournalRegenceToplines.pdf Accessed February 4, 2012. Clearfield E, Batalova J. Foreign-born health-care workers in the United States. Migration Policy Institute. http://www.migrationinformation.org/USFocus/display.cfm?id=583#6 Accessed February 4, 2012. Good Car Bad Car. Top 25 best-selling cars in America - 2011 year end. http://www.goodcarbadcar.net/2012/01/us-best-selling-cars-2011-year-end.html Accessed February 13, 2012.